Driving rain? No problem. Gusting wind? No problem. Tight budget? No problem. Buying this jacket from anywhere but West Marine? That's a problem. The first thing that comes to mind when you put on our exclusive Afterguard Jacket is how easy it slips on over other layers and how incredibly lightweight it is. The next thing you'll think is, "Wow! A jacket that's waterproof, windproof and breathable at THIS price?" 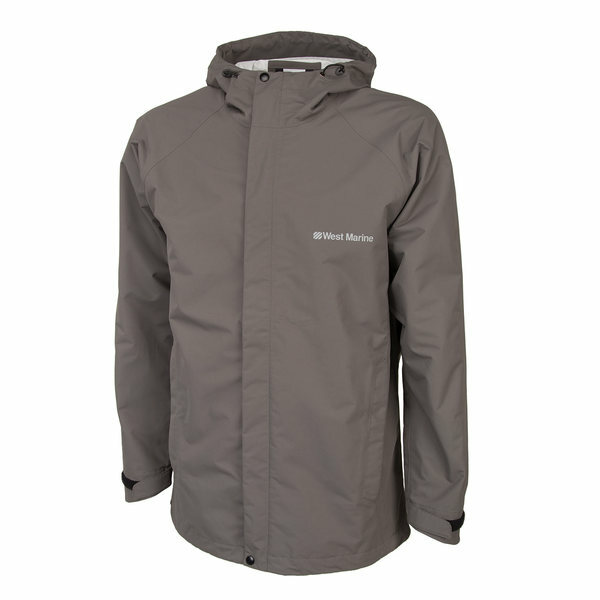 Yes, we designed this no-frills jacket to be an outstanding value, but we also gave it the same wet weather-taming outer shell as the last generation of our best-selling foul weather gear. Our lightweight Afterguard Jacket features two-layer construction: a nylon shell layer with a Durable Water Repellent (DWR) coating to make water just bead up and run off is bonded to a waterproof, breathable laminate layer with a thin nylon backing. There isn't a lining so you can easily slip your Afterguard Jacket on over mid-layer clothing without binding. All the seams are taped to seal out moisture and wind from trying to squeeze through their tiny openings. Hook-and-loop wrist adjusters help stop water from running up your sleeves. The attached hood is articulated (jointed) so it won't impede your vision as you move your head and includes one-handed shock cord adjusters. Speaking of articulated, the elbows are also cut just right so you'll enjoy a full range of motion without your jacket getting in your way. The hem on our Afterguard Jacket is longer in the back than the front to help keep you covered as you bend forward or reach up above your head. You'll also find quick-draining, mesh-lined hip pockets with zippers and two internal mesh pockets to stash your gloves, a VHF radio or other necessities. 100% nylon Taslan shell with polyurethane coating. Imported.